I’ve often written here about our Inner Critics or Gremlins. 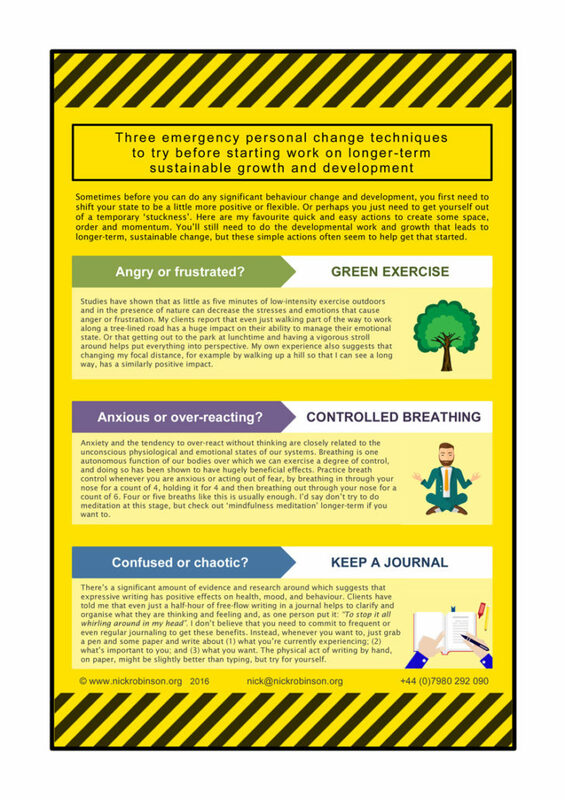 These are the unconscious thought processes that act to keep us safe by sabotaging our attempts to change or to do something challenging or outside of our comfort zones. Instead of keeping us safe, all this process really does is to maintain the status quo. And when things then change around us, as they inevitably do, instead of being ‘safe’, we’re left unprepared and disadvantaged. The very things our Inner Critics are fearful of tend to happen because of, not in spite of this process! That’s why getting clear about and learning to live with the Inner Critic process is such an important part of leadership and personal growth. But if you’re a leader, or anyone who really should be inspiring and developing the people around them, there’s another insidious aspect to this process. That’s when our Inner Critic is allowed to spill over and become our Outer Critic too. I’m sure there are many more examples. Like the Inner Critic, the Outer Critic has a similarly important function. It’s intended to keep us from harm or to avoid a loss of some kind. That’s why the times when we’re critical of others are usually when something that’s important to us is threatened by a shortcoming on their part. When their words or actions might lead to the loss of an opportunity or to some kind of ‘damage’ to a valued outcome, person or resource. The great paradox of the Outer Critic is that just speaking our criticisms of others actually rarely even makes us feel better. And even less rarely does just speaking a criticism by itself actually make any difference to what’s happening. I think our Outer Critic is a way of expressing our own fears, but without having to take any action that might put us out of our comfort zones. As my gran might have said: It’s all mouth, and no trousers. One of the turning points in my own leadership journey was the realisation that you simply can’t complain people into changing. If you want something different from people, without having to do so every time, criticising just does not work. So what should you do instead of criticising? Or if you’ve somehow go to a place where you realise you’re moaning, complaining about and criticising a LOT of people and things, how do you break out of that cycle? 1. Make sure you’re actively pursuing something positive that’s really important to you. 2. Either be prepared to get down in the arena and sort it out yourself, or walk on by. 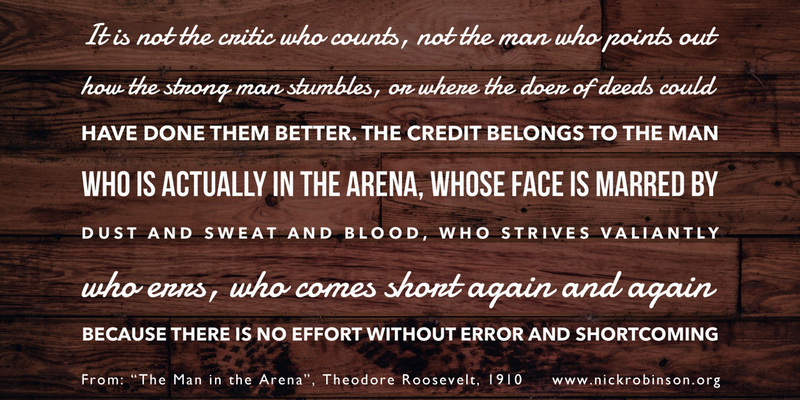 There’s a great passage from a speech in 1910 by former US President Theodore Roosevelt, which is often referred to as “The Man in the Arena”. I’ve put the relevant extract in the picture at the top of this article, which you can download and save for yourself by clicking and then right-clicking. The message is essentially this: be the one taking action, or move on. This quote is often attributed to Mahatma Gandhi: “Be the change you want to see”. It’s a really resourceful way of dealing with your Outer Critic. There are times for all of us when we genuinely don’t have the means, power or resources to step-in and deal with a particular issue, in a particular place and time. For those occasions when you can’t take action on that specific issue, but are convinced there’s a better way of doing things, then instead of moaning, complaining or criticizing, show people how it could be done, in the areas where you do have choice and control. Don’t criticize what is, inspire what could be. 4. Learn to make specific requests. One of my very early coaching instructors, the late Laura Whitworth, gave me this gem of advice: “A complaint is just an unvoiced request”. This is a fantastic discipline to practise if you find that your Outer Critic has made an unwelcome appearance. Take your criticism and search out the request that’s buried away inside it. For example, instead of saying to your companion in a restaurant: “I hate how they’ve given us a table in the draft by the door”, call over your waiter and ask to be moved. I can tell you from personal experience, that this ‘make a specific request’ approach sometimes even works with your teenaged children! 2. People won’t change unless they’re honest about their faults. People can’t change if they don’t like themselves. This first point is true because real change requires a positive mindset. It needs the ability to move towards something specific and attractive. If your mind is in a place where you’re constantly beating yourself up, or feeling at fault, or where you don’t like the underlying person that is really you, attempts to change just don’t work. They get sabotaged, overtaken or drowned-out by a focus on what’s wrong. But the second point is also true. People won’t change unless they’re honest about their faults. If my delusion that I don’t need to grow or change is so complete, where’s my motivation to change? If I can’t see myself as others see me, to understand the impact I have in the way that I do things, how do I know that a different approach might also be possible? But seeing your faults is painful and raw. Knowing that your typical way of doing things is having a negative impact on others usually doesn’t make you feel like high-fiving yourself. And this is the situation that about a third of my clients find themselves in when they arrive for their first coaching. They’ve come to me because their way of doing things at work is no longer getting results. Often, their behaviours are out of sync with other people, or even causing problems. If the situation has been allowed to continue for too long, this person may even have acquired a reputation for negative behaviour that precedes them; that is worse than their actual behaviour. This is a tough situation to be in, and a hard one from which to to make effective changes. So here’s one of my favourite techniques for resolving that dichotomy and making effective change in behaviour at work. To learn to like yourself and all your traits, and to be honest about your faults. I call it the Silver Dollar Approach to Behavioural Change, because (a) a Silver Dollar has two very distinct sides; and (b) I’ve got a Silver Dollar that I brought home from Las Vegas and am very fond of. This technique is so easy that you don’t even really need a Silver Dollar to make it work. “Well, I’ve been told that at team meetings I can be like a bull in a china shop”. “I suppose you could call that being Direct“. Imagine that quality was a Silver Dollar. So now we’ve got a Silver Dollar with the quality of being “Direct“. Now, whether you tend to hang out in Las Vegas or not, you’ll know that a Silver Dollar is a valuable thing. If you’re a cowboy, you probably keep one in your boots to pay for your funeral. In my view, everybody should have several. Joking apart, what I’m trying to say here, is that all human qualities have value – and they also have two sides. So the thing about this Silver Dollar is that its value depends on where you are and on what kind of situation you find yourself in. Side 1 – can be about situations when this particular Silver Dollar is really, really useful. Side 2 – can be about situations when this particular dollar is less useful, maybe even counter-productive. What are the kind of situations at work when being Direct is really useful? In what kind of situation is Direct less useful? What’s it like for other people when the Direct silver dollar comes out at the wrong time? This is a key step in the process. What’s often happened for people who are struggling at work is that they’ve been relying on one of their strongest qualities too much. They’ve unconsciously seen that it worked for them in the past, now they use it in all situations regardless of whether it will work or not. They’re spending the same silver dollar over and over. The coach’s job at this point is to explore a number of other qualities that this client also has. Look for qualities, ways of being, typical styles of doing things. And especially listen out for qualities of theirs that the client might not like. For example: “I can sometimes doubt myself and I try hard not to show it”, can become the quality of “Intuition“. And being able to say in a meeting: “Actually, my intuition tells me there’s something we don’t quite understand here”, is a great partner to the quality of being “Direct“. Keep going until you’ve identified number of qualities and have explored when they’re most useful and when they’re less useful. The thing I love most about this technique is that you’re not so much asking someone to change, as actually helping them to bring out different aspects of who they really are, at times when that is useful for them. For me, this resolves the dichotomy I mentioned at the start, because you can both like all the qualities that represent your behaviours and be open to how they impact other people. One of the great strengths of the way the human mind works is our ability to make meaning of the world around us. This happens all the time, mostly unconsciously and starts at a very young age. You’ll have seen how young children never seem to stop asking questions that seek to understand the meaning behind things: Why is that tree green? What does that lady wear such a big hat for? Why aren’t there any more dinosaurs? You’ve probably got a few favourite examples you’ve heard yourself! I think there’s a clear advantage to us as humans to be able to do this. As we were evolving as a species, being able to interpret and understand the world around us, to know what certain events and significant moments mean, would have been of great help. We see food that is an unusual colour and we know it probably means it’s unsafe to eat. We notice smoke and understand that it means fire is nearby. Loud and sustained shouting may mean that a violent confrontation is taking place. Three or four people heading-off in a different direction to us might mean that they know about a food source. This pattern continues through our lives. We notice something important, or a significant event happens, and in order to make sense of it, we interpret or attach meaning to it. And it’s also useful that this meaning-making process mostly occurs unconsciously. Imagine if you had to stop and think about everything all the time in order to understand its meaning. There wouldn’t actually be enough time left to do anything with the information! It’s important that our minds have these kind of shortcuts so that the meaning of everyday events and interactions with others isn’t something that we consciously need to analyse and interpret. Otherwise it could quickly become overwhelming to do so. But problems can arise when the meanings that we give to significant events or moments become like rules or automatic shortcuts. When we start to believe that X always means Y. Or when we automatically interpret X as meaning Y, when a wider view of the situation or a more complete weighing of the evidence might suggest a different meaning. In those cases, this ability to look for the meaning behind things can become a hindrance not a help. When we’re looking for the meaning behind an event or interaction and it’s not making sense or it doesn’t fit the usual pattern we’re expecting – to continue searching for it can be particularly disempowering. My colleague never smiles at me; she doesn’t like me. My team member was late for our appointment; he has no respect for my time. The Board haven’t responded to my email; they can’t be interested in my idea. I always feel out of place in our Executive meeting; I ‘m not the kind of person that belongs here. I can’t seem to get everything done in the time available; I’m just not disciplined enough. This pattern becomes a problem, as I’ve said earlier, when we assume that “this” always means “that”; or when a wider view would suggest something else. AND – it becomes a really disempowering pattern when we put our focus on finding the meaning itself, but the meaning isn’t actually what’s important. Why doesn’t she like me? Why doesn’t he respect my time? Why aren’t they interested in my idea? 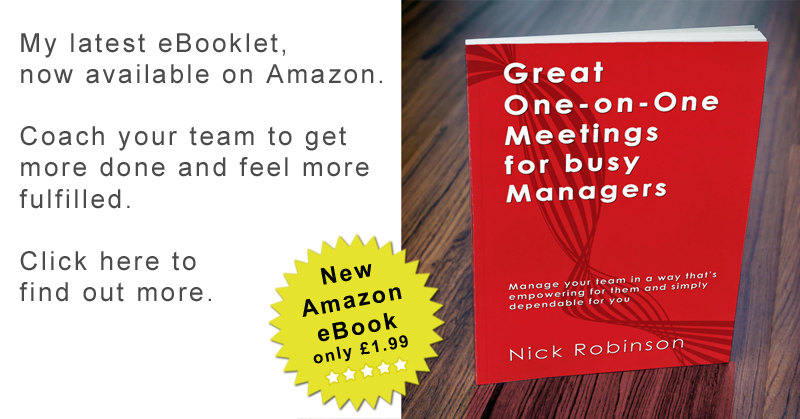 Why can’t I be more assertive in the Executive meeting? Why can’t I be more disciplined with my time? These kind of “Why” questions are a potentially useful indicator that you’ve slipped into a disempowered mindset. In a way, it’s a kind of return to being like that little child, trying to make sense of the new and huge world around them. And wanting a grown-up to explain it all to them. In those situations, we need to stop searching for the meaning we expected to find. We need to stop taking that automatic shortcut. Fortunately, there’s very easy way to do so. Here’s how. For the reasons described above, us coaches very rarely ask “Why” questions of our clients. In fact, if your coach asks you a “Why” question, it’s quite likely that they think they’re spotted an unconscious meaning or interpretation of yours that is not helping you – and they’re trying to uncover it more fully. Instead of trying to figure out the “why”, your coach will help to look beyond that automatic search. Coach: What do you actually want in this situation? Client: All I really want is a good enough relationship with her so I can do my job effectively. Coach: What evidence would you need to see or hear to know that your working relationship was good enough? Client: Mostly it would be that she answers my calls or gives me time when I need help with issues in her speciality. Coach: If you didn’t have that straight away, how would you go about getting it? Client: Actually, and this has worked in the past, I’d either book time ahead with her, or check if it was OK to go directly to one of her team members. Coach: And how do you feel now about her not smiling at you? Client: Well, I know that smiling and being seen to be friendly is important to me; so that’s what I’m going to do myself. I’ll never really know if she likes me or not, but that isn’t what’s important here. What Strategy (the how) will you use to get what’s actually important to you. 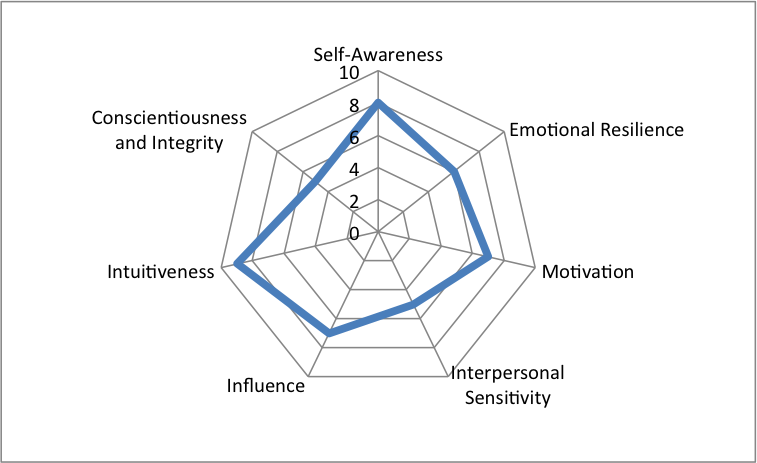 If you’re about to review your performance over the last year or so, you could try doing so through an Emotional Intelligence (or EQ) lens. EQ is one of my favourite ways of looking at how well I’m doing, because it suits a behavioural approach (my actions and their impact). It supports a deeper understand of what drives those actions and what does or doesn’t make them effective in my interactions with others. Plus, there’s research to show that high levels of EQ are correlated with individual success and performance in a work context. Although definitions vary, in my view you could regard Emotional Intelligence as the ability to be aware of and manage our own feelings and emotions, to be aware of and able to influence other people and to balance behaviours which benefit us individually with those that benefit the team and organisation. 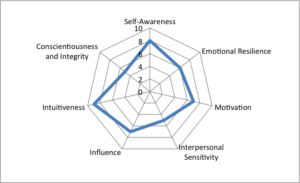 If you want to have a go at reviewing your own performance in EQ terms over the year, click-on and download the blank spider chart at the top of this article and then score yourself on the following seven elements. These come from one of my preferred models of EQ, established by two British authors from Henley Management College in their book Making sense of emotional intelligence. Score yourself from 0 – 10 and then mark it in the chart. See my example below if you’re unfamiliar with this kind of spider chart. How well do you feel you did during the last year? The awareness of your own feelings and the ability to recognise and manage these. The ability to perform well and consistently in a range of situations and when under pressure. The drive and energy which you have to achieve results, balance short and long-term goals and pursue your goals in the face of challenge and rejection. The ability to be aware of the needs and feelings of others and to use this awareness effectively in interacting with them and arriving at decisions impacting on them. The ability to persuade others to change their viewpoints on a problem, issue or decision. The ability to use insight and interaction to arrive at and implement decisions when faced with ambiguous or incomplete information. The ability to display commitment to a course of action in the face of challenge, to act consistently and in line with understood ethical requirements. Here’s my own; got some work to do on actually seeing stuff through to completion and being more considerate of how my actions affect others.